A world leader in steel corrugated storage bin manufacturing, GSI introduces the 1.1 Million Bushel Bin. When you need to store large amounts of grain without the labor and handling costs of ground piles and flat storage, the GSI Million Bushel Bin can answer your call. Built to last, this bin is constructed with double laminated, 6 gauge sheets in the bottom rings verses competitor’s triple laminated thinner sheets. GSI uses the heaviest sidewall sheets in the industry with galvanized material up to 5 gauge. Six bolt seams hold each sheet securely in place. Precise construction elements hold GSI’s Million Bushel Bin above the rest allowing for easy erection. The GSI Million Bushel Bin uses a high strength six bolt connection and up to 5 gauge sheets. This bin is constructed with double laminated 6 gauge sheets in the bottom rings verses competitor’s thinner triple laminated sheets. Tank strength is further maximized through the use of GSI’s strong upright stiffener columns which carry the vertical load of the bin to the foundation. Manufactured from high strength 65,000 PSI (450 MPa) steel, GSI’s stiffeners feature strong splice joints with large cross sectional areas, both critical elements of vertical stiffeners. These stiffeners are galvanized and mounted externally. 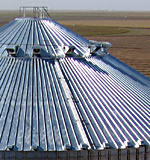 A standard two ring sidewall door is supplied with each million bushel bin. This door has a two piece inner door design that allows for easy access to your sweep. An optional vehicle traffic door is available for greater access. Heavy zinc plated, high strength, dichromate coated bolts up to grade No. 8 are used on all GSI bins. Each bolt has a special sealing washer for an unbeatable weather seal. Six bolt seams hold each sheet securely in place. GSI’s free span roof uses I-beam roof supports and a standard 10′ center peak platform providing a large surface to attach overhead equipment, spouting, etc. without costly field fabrication. GSI bin roof ribs are taller, fully double lapped and have four extra reinforcing ledges. The roof ribs, together with corrugated panels and 55,000 PSI high tensile steel, combine to form an exceptionally strong and reliable roof panel system. Each roof panel is manufactured using GSI’s exclusive, fully automated, roll forming line. This insures a precise and consistent fit throughout assembly and helps maintain a tight steel to steel seal between panels. Only GSI offers this level of accuracy in roof panel manufacturing. GSI’s hinged grill vent features a vertically mounted, large mesh, wire formed screen to keep out pests and swings freely open to allow easy release of trash buildup. The vents are assembled with a heavy duty lock seam for added strength. 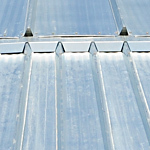 Pre-punched, extruded lip roof panels and a special die-cut gasket help provide a weather tight connection between the vent and roof panel. GSI also manufactures a power roof exhauster for situations requiring greater airflow. 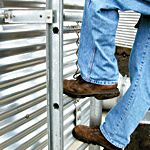 Each bin can be ordered with a sturdy sidewall ladder for easy access. Each ladder section is made from roll-formed side rails with press fit dimped rungs. Ladder sections are attached to the bin wall with compression type connectors to allow for easy assembly and adjustment. 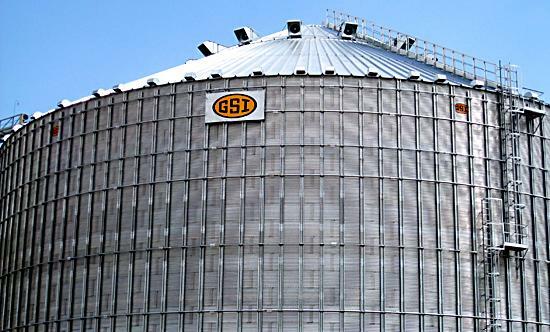 GSI manufactures fans, transition and flush floor aeration systems custom designed for the GSI Million Bushel Bin.